The ADEX Dental Examination is administered by CDCA in the CIF format for senior dental students and in the Traditional format for all other candidates. Click here for the specific locations or here for dates of upcoming CIF and Traditional format examinations. Both the CIF Format and Traditional Format of the Dental Licensing Examinations are ADEX Dental examinations. Because of the different timing of these two examinations, a different manual is available for each of the formats. You can download these manuals from this website: Go to Dental Manuals. According to state regulations, in order to be considered an ADEX Dental Examination, all parts must be taken in the year 2006 or later. Therefore if one or more of the five parts of the examination were taken in 2005, even if the examination is not completed until 2006, this is considered a CDCA examination (accepted in 18+ states) but not an ADEX approved examination (accepted in 40+ states). In the same fashion, if a CDCA examination was successfully completed in 2005 (or prior year), it will not be accepted as an ADEX examination, even if the content of the examination is nearly identical to that of the current ADEX approved examination. To be accepted as an ADEX approved examination all five parts must be taken and passed in 2006 or later. The ADEX Dental Hygiene Examination is designed for students about to complete dental hygiene training and graduate dental hygienists. 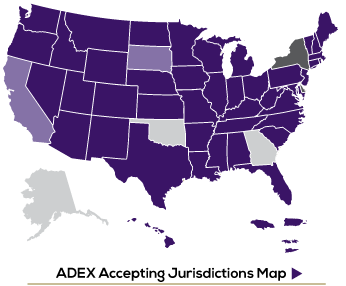 According to state regulations, in order to be considered an ADEX Dental Hygiene Examination, all parts must be taken in the year 2009 or later. Click here for the specific locations or here for dates of upcoming examinations. You can download the manual from this website: Go to Dental Hygiene Manuals.